To finish off our winter relief series, treat your little tootsies to a warm, fizzy, epsom salt soak. 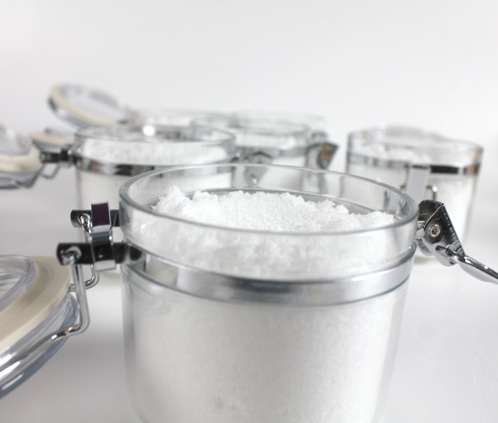 Epsom Salt has been long known for it’s abilities as a natural remedy for so many ailments. Plus I’ve designed a special “sore muscle” essential oil blend that will diminish your foot cramps, aches and pains from a long day on the mountain. After the salt soak you can lather your feet in our winter body balm recipe and be sure to check out the winter lip balm recipe to complete the winter series! Buy everything you need in the click of a button! PREP: Blend your essential oils together to make the “sore muscle blend”: 4 ml Eucalyptus, 1 ml Black Pepper, 2 ml Litsea. ONE: Combine the Epsom Salt, Baking Soda and Citric Acid in a mixing bowl. Mix with a spatula (or your hands) until all of the clumps are gone and the dry ingredients are mixed together. If you mix with your hands you may want to wear gloves to save your nail polish from the citric acid. 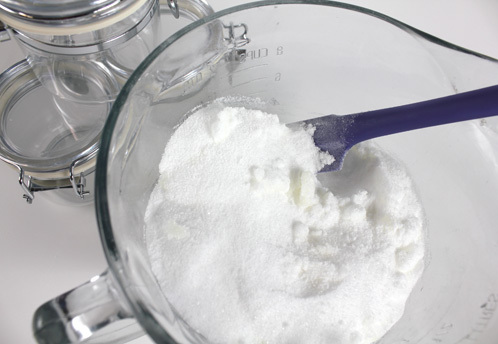 TIP: Sift the baking soda to easily get rid of large clumps. TWO: Mix in 12 ml of Meadowfoam Oil and 7 ml of your essential oil blend. Mix well with a spatula or hands and use a spoon to divide the salt soak between 6 large bail bars. 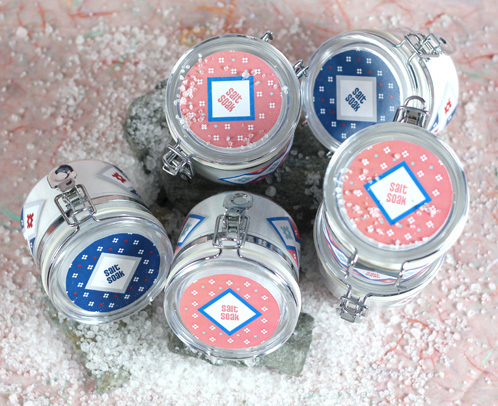 Packaging Tip: Make sure that you package the soak in plastic bail jars or plastic bags. This combination of citric acid, baking soda and moisture causes a release of carbon dioxide which can build up pressure in a container so we don’t recommend glass. 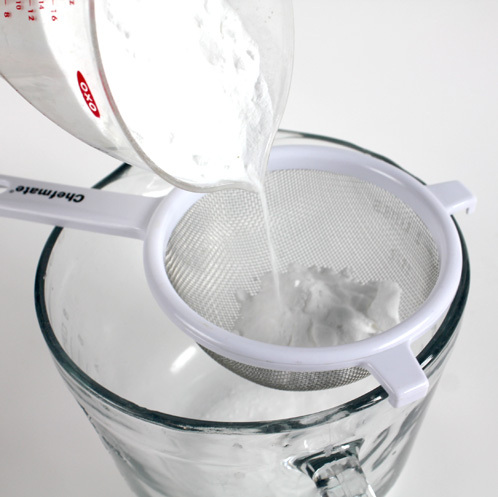 Salt Soak Usage: 4 tablespoons of salt soak per 2 quarts of water. Feel free to add more if you want the scent stronger. This ratio is what we liked the best. Previous Post: What’s New at Bramble Berry? Is it possible to make this in a the shape of a cube or square like the sugar scrubs squares and what would I add. I would like to make this to use for travel or even without a jar. This could cut out the customer getting water and the nasties invading. Also, if I need to use a preservative, I have some but not sure how to use it because, I don’t know how much or should I say what measurement to use. Help and thanks for the idea. Salt soaks aren’t particularly moladable like sugar scrubs because that is the natural of a salt soak. If you are interested in a a cube or square type-scrub, I’d take a look at the link below. It’s great for traveling and you don’t even need a jar. Could we use glass mason jars if we punched breathing holes in the metal lids? Would adding a silicone moisture wicking packet inside also help? You could totally use glass mason jars, but be aware that allowing air in can also bring moisture that may harden the salts. We’ve never used a moisture wicking packet in our tutorials, but it could totally work for your idea! What about preservatives on this one… any concern in regards to the reactive quality this has and preservatives? We didn’t use any preservatives in this particular recipe because there is no water. But, if you wanted to use a preservative, I’d suggest using the Phenonip as it is the best one we’ve found for salt scrubs and soaks. i am new to starting to make my own bath salts….do i have to dilute the EO’s before adding them? my bottles have a warning to not apply directly to skin. just wanted to be safe! thank you for all your great work! Wonderful item even without the fragrance oil (which I am sensitive to). It’s also perfect for removing dead skin from feet as well. In some of your other “recipes” you use sea salts. Can you substitute sea salts for epsom salt? I love the simplicity of this project! I’m done with gifting for this year, but want to make these for next year: could you, pretty please, re-post this in November 2012 (to give me enough time to make them for all the women on my gift list)? Thank you! Aw, you’re so sweet. I’m glad you like the recipe. Thanks for the props!